How to traverse through a binary tree and output the value of the balance factor for each single node? Is there any way to stop Mutter from removing decorations/borders of maximized windows? How can I get the real size of a JFrame when I am using a tiling window manager? It prints the line that says Error connecting the the X Server, try %d\n 8191 times every time I run the program. When I looked at what was going on with gdb, it seems like every time I call xcb_connect, my code goes into this deep recursion thing (like thousands of frames deep) between xcb_connect_to_display_with_auth_info() and my connect() function. The part that really confuses me is how xcb_connect_to_display_with_auth_info() can even call my connect() function at all, because it's from a separate library and I haven't passed in a pointer to my function. My code looks to me like it's behavior should be completely "linear", but that's not the case at all. I'm testing the window manager by running Xephyr with the X server name :1 and setting DISPLAY to :1 before running the program. I'm somewhat new to XCB and C itself, so I'm probably missing something blatantly obvious, but I would appreciate any pointers. I've been looking at hootwm for inspiration mostly so far. I am passing in two lists of element E and want to insert one of the lists into the other at a specified index. I get the error "List cannot be converted to E" and I am unsure how to convert the element. Should I perhaps try something different than .add() or is it possible to convert an element so it will work with the .add() method? I need to return a List for the other method I am calling this from. Edit2: As Gustavo pointed out all I needed to do was add c.get(0) for the element location. Im sitting since 2 days in front of a problem and i just cant figure out the solution. I want to traverse through a binary search tree and print out the balance factor of each and every node ( not a boolean alue if its balanced but the actual factor ) I think ive searched the whole internet for a possible solution.... it seems like nobody has ever done this before. Its all just boolean values of the general balance of the whole tree. I tried drawing about 20 sheets of paper trying to visualize and to write code by myself. Time is running out for my homework. I really need a solution. I have a fullscreen application running on Ubuntu 16.04 LTS. The device is equipped with a 10 finger touch screen. When the user touches the screen with multiple fingers, Ubuntu activates drag handles and the user can resize or move the window, which I want to prevent. Of course, I could switch to a different window manager, but for sure there is a way to exclude a full screen application from the drag handles (for games, video players etc.). I believe I have to set certain window hints. Does anyone know how to achive this? Xlib: extension "GLX" missing on display ":26.0"
However this error not occured when other user uses the vncserver command and open this software (e.g. user8 ; display number:8.0). exactly I lose the "GLX" and "SGI-GLX". What cause this difference? Actually,there are no environment variable different between us. A classical problem with tablet on dual screen is that you want to reconfigure the active area to one single screen (or the circles you draw will be very stretched ellipses :-) ). In older ubuntu I used to rely on wizardpen driver, and set MaxX and MaxY in /etc/hal/fdi/policy/99-x11-wizardpen.fdi , but hal no longer exists in ubuntu18. I don't know how to setup xorg.conf directly as well since I don't know which driver is used: my ThinLine UC-LOGIC_Tablet_WP5540U tablet is recognized automatically; but wizardpen no longer exist; might it be "wacom" - installed by default - that rule them all ? (but xsetwacom does not recognize my tablet properties ). I found only these deprecated ways online. -> how to ? 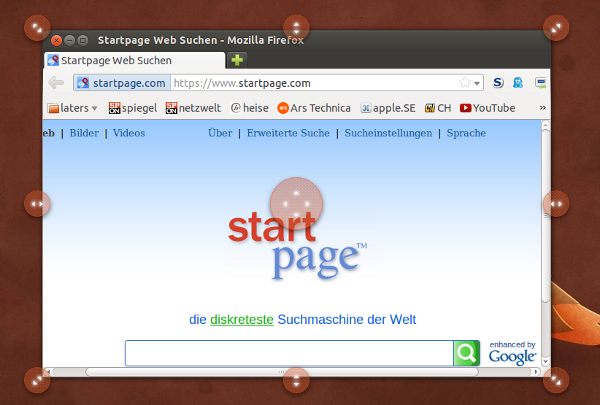 I would like to be able to resize maximized windows on Mutter. Is there any way to tell Mutter to not remove the borders when the state is "maximized", so that I can maximize and then resize? Or, if there was a way to "hijack" where Mutter performs this action and override the behavior--even forking Mutter. I have made a script where it uses xdotool to do some keyboard inputs. You can find the script here (The script is called pop_mpv.sh). The script works perfectly when I run it from a terminal, but it does not work properly when I have the script bound to a key. I tried what suggested in this question, but it did not work. I use a tiling window manager on GNU/Linux, and therefore windows, instead of taking up the size given to it (through, for example, frame.setSize(500, 500), but as much space as it can take up. However, frame.getSize() will only return the size it is set to, not the actual amount of space the window takes up on the screen. I noticed this when changing the background color, as only the 500x500 area would be filled. How can I get the "real" size of my window, and use that information to more cleanly/symmetrically/accurately draw to the window? Application is using SDL 1.2.15 (cannot be upgraded) and draws itself using SDL_UpdateRects. After such paint it notifies another app which tries to get screenshot by xcb_get_image_reply. Problem is that randomly xcb_get_image_reply returns image without expected change. It looks like some data are buffered and screen is not updated at the moment of taking screenshot. Is there some simple method to ensure the screen is updated after SDL_UpdateRects, preferably using SDL or XCB? (I would like to avoid calling xrefresh). I already posted a question in Qt forum (here: https://forum.qt.io/topic/101608/how-to-port-qapplication-x11eventfilter-to-xcb-qabstractnativeeventfilter) but without success yet, I post it here too in case somebody has the solution. Now we fall in xcbEventType == XCB_BUTTON_PRESS on button press but casting to xcb_button_press_event_t seems to have no meaning since root_x, root_y, event_y and event_y members have always the same values anywhere we click. Anyone knows how to properly implement this ?